Wel­come to the sec­ond part in this series. It’s time to get into some math and learn how to con­trol the posi­tion, rota­tion and scale of the mesh. This tuto­r­i­al builds on the lessons of part one. If you find your­self lost too often, try going back. 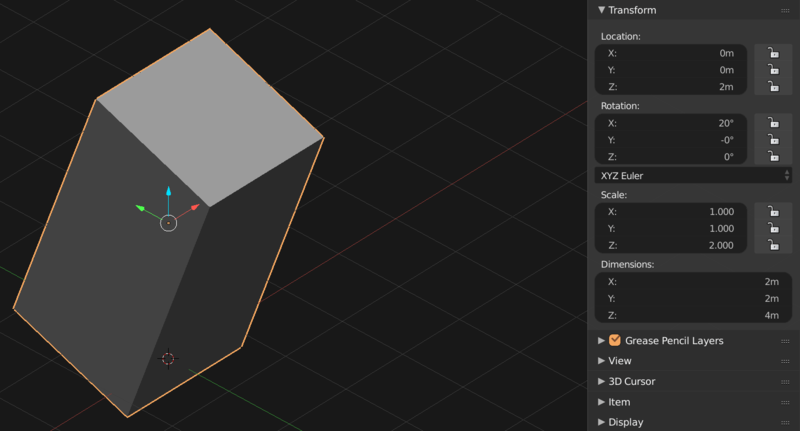 Today we will quick­ly look into mak­ing cubes, and then jump into con­trol­ling the mesh and ori­gin point’s posi­tions. Final­ly we’ll dive into trans­for­ma­tion matri­ces and learn how to per­form trans­for­ma­tions nice and fast. Let’s start by import­ing the pack­ages we need. Besides the usu­al bpy, we are also going to use the radians() func­tion from Python’s math pack­age, as well as the Matrix class from mathutils (this one is from Blender). As before, I’ll have a sec­tion to put vari­ables in, then util­i­ty func­tions and final­ly the main code sec­tions. The vert() func­tion looks use­less now but we’ll need it for the next bit. Mak­ing a cube is less glam­orous than you would expect since there’s no fan­cy algo­rithm to make them. Instead we have to input the vert posi­tions and faces man­u­al­ly. Luck­i­ly cubes only have 6 faces and 8 ver­tices. Run the script now and you will be reward­ed with a very default cube. Now that was easy! Let’s see what we can do with it. Every object in Blender has an ori­gin point that deter­mines their posi­tion in 3D space. In fact when we talk about an object’s posi­tion we actu­al­ly talk about the posi­tion of its ori­gin point. On the oth­er hand when we talk about an ori­gin points’ posi­tion we actu­al­ly talk about the ori­gin points’ posi­tion rel­a­tive to the mesh. Con­fused? Look at the fol­low­ing dia­gram. As you can see when the orange dot (the ori­gin point) is on the grid, the object’s posi­tion is (0, 0, 0) while when it’s up by 1 on the Z axis the posi­tion is posi­tion is (0, 0, 1). But the inter­est­ing bit is the mesh’s posi­tion. In both cas­es the mesh if off­set by 1, but in the sec­ond case it is -1. If the mesh’s posi­tion was (0, 0, 0) it would be up in the air, right where the ori­gin is. As you can see, the mesh posi­tion is rel­a­tive to the ori­gin but inde­pen­dent from the origin’s posi­tion in the scene. Change the mesh in rela­tion to the ori­gin point. This is the same as mov­ing the mesh in edit mode. 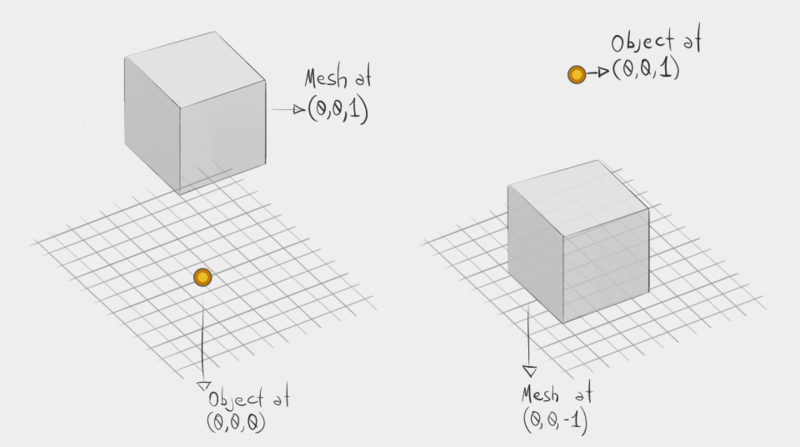 Change the ori­gin point while leav­ing the mesh in the same place. For this tuto­r­i­al that would be the cen­ter of the scene. We will begin by chang­ing the posi­tion of the mesh rel­a­tive to the ori­gin point I will be call­ing this off­set to keep things short. We can use the vert func­tion to move the mesh with a sim­ple addi­tion. An off­set of 1 on Z will make the cube rest on the grid with the ori­gin point at its bot­tom. Now let’s try mov­ing the ori­gin point while keep­ing the cube at the cen­ter of the scene. There’s only one small prob­lem: we can’t move the ori­gin itself. Mov­ing the ori­gin is mov­ing the object, since the ori­gin rep­re­sents its posi­tion in space. What we have to do is to change the ori­gin is move the mesh as before and move the object by the oppo­site of that off­set. Remem­ber loca­tion is a tuple, so we have to use an expres­sion to set it. Try run­ning the code now. The cube mesh is back at the cen­ter of the scene. But the ori­gin point (and the object) is now at (0, 0, -1). Since we are chang­ing the loca­tion using the neg­a­tive of the off­set, the result­ing posi­tion of the object is neg­a­tive. Like­wise using a neg­a­tive off­set results in a pos­i­tive posi­tion for the object. Give it a shot. So what if you want to change the ori­gin and also change the mesh posi­tion in any arbi­trary way so it’s not always at the cen­ter of scene? We can add anoth­er off­set to rep­re­sent that. And then we can add this off­set in the loca­tion expres­sion to move the mesh. Let’s also rename the pre­vi­ous off­set to keep things clear. Note that we have to use enumerate() now to get an index for the addi­tion. There are sev­er­al oth­er things we could do with expres­sions and the vert() func­tion. But there’s anoth­er way of trans­form­ing mesh­es and objects. A way that is both clean­er and faster. In math matri­ces are rec­tan­gu­lar arrays of num­bers (and some­times oth­er things). They can be added, sub­tract­ed and mul­ti­plied between them­selves. You will find matri­ces in almost every field where math is involved. The only field we care about though, is com­put­er graph­ics and in this con­text matri­ces are used often to rep­re­sent trans­for­ma­tions. This includes things like trans­la­tion, scal­ing or rota­tion. Matri­ces that rep­re­sent lin­ear trans­for­ma­tions like these are called “Trans­for­ma­tion Matri­ces”. Objects posi­tion, rota­tion and scale are defined as trans­for­ma­tion matri­ces in rela­tion to a coor­di­nate sys­tem. Even when you think there’s no trans­for­ma­tion! For instance, let’s imag­ine a “default object”. This object sits at coor­di­nates (0, 0, 0) of the scene, has a scale of 1 and a rota­tion of 0 (on all axis). We can rep­re­sent the loca­tion, scale or rota­tion of any object as a trans­for­ma­tion matrix of this default object. In Blender this is called a World Matrix, and it is a prop­er­ty avail­able in all objects. By the way, “scene coor­di­nates” are actu­al­ly called “World Coor­di­nates” in Blender. There are oth­er coor­di­nate spaces, as well as matri­ces for them but we will look into that in anoth­er part of this series (promise!). Note that you don’t need to be a matrix wiz­ard to use them. 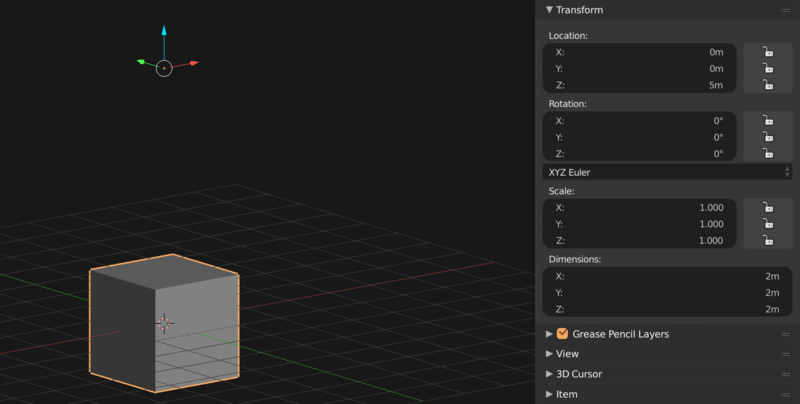 The blender devs have blessed us with a Matrix class that does almost all the work for us, and you might not even have to see a matrix while you’re work­ing with them. Feel free to jump to “Putting it all togeth­er” if you’re not inter­est­ed in the math. Still here? Alright, let’s play with this matrix con­cept for a moment. Go ahead and add a new object (using Shift+A). Select it, then paste this script on a text edi­tor and run it. Since we haven’t moved, rotat­ed or done any­thing to the object, its val­ues are the same as our imag­i­nary “default object”. A matrix like this is called an Identity Matrix in math, and it means there’s no trans­for­ma­tion. Now move the cube some­where and run the script again. Aha! Now the matrix includes some change. The val­ues will be dif­fer­ent depend­ing on where you move the object. As you can see the last col­umn includes the X, Y, Z coor­di­nates in rela­tion to the cen­ter of the scene (world space). What if we reset the loca­tion (Alt-G) and try scal­ing instead? Now the last col­umn has no change since the object is back at (0, 0, 0) How­ev­er we can see three val­ues have changed to rep­re­sent scal­ing on X, Y and Z.
Rota­tion is more com­pli­cat­ed since you can rotate around three axis and each rota­tion is rep­re­sent­ed by trans­for­ma­tions on the oth­er two axis. This goes a bit out of scope for this tuto­r­i­al, so I’ll leave sev­er­al links at the end in case you want to get deep­er into the math. You might also be won­der­ing about the last row. Trans­for­ma­tion matri­ces for 3D are actu­al­ly 4D, the last row is an extra dimen­sion. This is a math­e­mat­i­cal “trick” to enable the matrix to per­form trans­la­tions. Again, I won’t get too tech­ni­cal about this. Check the links at the end for more info. In any case, it’s not impor­tant for our pur­pos­es since it will nev­er change. Trans­for­ma­tion matri­ces can be com­bined to cre­ate a sin­gle matrix that includes all the result of all the trans­for­ma­tions. This is done by mul­ti­ply­ing them. That means we can take an object’s world matrix and mul­ti­ply it by a trans­for­ma­tion matrix to get a new matrix that includes the changes in both matri­ces. We can then assign it as the object’s world matrix and thus trans­form the object. It’s time to whip out that Matrix class and see how we can use it to gen­er­ate matri­ces. Let’s start with the eas­i­est: mov­ing stuff. All we have to do is call the Translation method of the Matrix class with a vec­tor (or tuple) of val­ues for each axis. Scal­ing takes three argu­ments. The first one is the scale fac­tor. The sec­ond one is the size of the matrix, it can be either 2 (2×2) or 4(4x4). But since we are work­ing with 3D objects this should always be 4. The final argu­ments is a vec­tor to spec­i­fies the axis to scale. This can be either zero for no scal­ing, or 1 to scale. Rota­tion takes almost the same argu­ments as scale. The first is the angle of rota­tion in radi­ans. The sec­ond is the size of the matrix (same as before). And the third is the axis of the rota­tion. You can pass a string like ‘X’, ‘Y’ or ‘Z’, or a vec­tor like the one in scale. We can chain trans­for­ma­tions togeth­er by mul­ti­ply­ing them one after the oth­er. But beware, Matrix mul­ti­pli­ca­tion is not com­mu­ta­tive. Order does mat­ter. Start by trans­la­tion, then rota­tion and scale. If you’re get­ting strange val­ues that look like round­ing errors, look at the order in which you are mul­ti­ply­ing. Matri­ces can also be used to change the mesh instead of the object. To do this we can use the transform() method of in objects. All it asks for is that you give it a matrix. Don’t for­get we can also com­bine matri­ces by mul­ti­pli­ca­tion so you can do sev­er­al trans­for­ma­tions in one go. Not only are matri­ces faster but this method also goes straight to C, so it per­forms con­sid­er­ably bet­ter than cal­cu­lat­ing the posi­tion of each ver­tex in Python (which is quite slow and expen­sive). On top of that, we can do this in a sin­gle line. This cov­ers this part in the series. If Matri­ces have peaked your inter­est here’s a few links to learn more. The links are in order of dif­fi­cul­ty. Put this all in a loop and make mul­ti­ple cubes fol­low­ing a sequen­cial trans­for­ma­tion, like mak­ing a wave or rotat­ing around an axis. In the next tuto­r­i­al we’ll be look­ing at mak­ing Icosa­he­drons and sub­di­vid­ing them to approx­i­mate a sphere. Do you have any ques­tions, or sug­ges­tions for the next tuto­ri­als? Leave a com­ment below!